Welcome Home Series handlesets are the perfect addition to your front door to create a unique and fashionable entryway to your home. Each is stylishly designed to provide maximum-security protection. There are many styles, finishes and configurations from which to choose. Toluca's fashionable wave silhouette design is the perfect complement to homes with inspired style. This half-dummy, or trim function, is surface mounted on doors where only a pull is required. The Antique Nickel finish offers a warm feel to the products style. Are you looking to give your home a face lift? Why not start with your door locks? Forge's varied collections will add a touch of style, with their top-notch mechanism that has been proven time and again. Our collections, designed for various functions, are available in a range of styles and finishes. The Schlage Merano Lever Non-Turning Lock in Satin Nickel is commonly used as a decorative pull for doors that don't require latching. The Merano lever has a graceful curve that makes it as delicate as it is chic especially when wrapped in our versatile Satin Nickel finish. Plus, it's been designed and tested with strength and durability in mind. 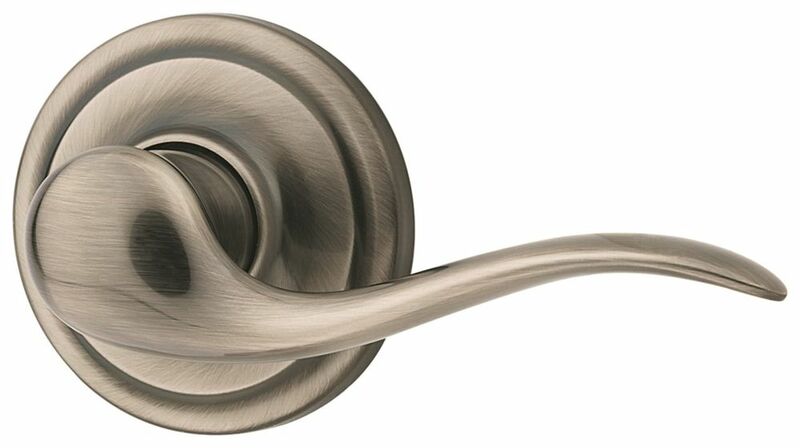 Toluca Dummy Lever in Antique Nickel Welcome Home Series handlesets are the perfect addition to your front door to create a unique and fashionable entryway to your home. Each is stylishly designed to provide maximum-security protection. There are many styles, finishes and configurations from which to choose. Toluca's fashionable wave silhouette design is the perfect complement to homes with inspired style. This half-dummy, or trim function, is surface mounted on doors where only a pull is required. The Antique Nickel finish offers a warm feel to the products style.